Experts say there’s no point in developing the gas condensate field right in the Barents Sea now, as the project is difficult and costly and may fail to find sufficient demand. After years of failed attempts to start developing one of the world's largest gas fields, Gazprom might delay the Shtokman project for decades. The shale revolution in the US – the project’s key export market – is undermining its profitability. Development of the Shtokman gas condensate field in the Barents Sea will most likely be postponed “for future generations,” Vedomosti daily quotes Andrey Kruglov, Gazprom deputy chairman. This week Russia’s gas monopoly is due to discuss the future of the world’s biggest gas deposits, where an estimated 3.9 trillion cubic metres of gas is held. Experts say there’s no point in developing the field right now, as the project is difficult and costly and may fail to find sufficient demand. US shale gas has definitely “undermined Shtokman that was oriented on the US market,” says Tatyana Mitrova, the head of Russia’s oil and gas development department at the Energy Research Institute of the Russian Academy of Sciences. “The deposit is difficult…the problem is that there’s really no other market left for Shtokman, after it became irrelevant for the US,” agrees Michael Korchyomkin, a director at East European Gas Analysis. Having been developed at the beginning of this century, the production of shale gas in the US has significantly moved on. In 2010, shale gas represented more than 20 percent of the country’s gas production, according to the International Energy Agency (IEA). The agency also said that by 2035 around 40 percent of the world’s gas might be unconventional, and shale gas will by far be the greatest part of it. “Gazprom has been trying to start developing the project for about 10 years. They planned to liquefy part of the extracted gas and deliver that to the US, and transport another part to Europe through a pipeline. The trans-Baltic Nord Stream pipeline was being built for that project,” Kruglov explained. Initially it was planned to start extracting gas from the Shtokman field this year. Its income and expense pro forma is estimated at $30 billion. The Kirinskoe deposit is 28 km from the shore at a depth of 90 metres. 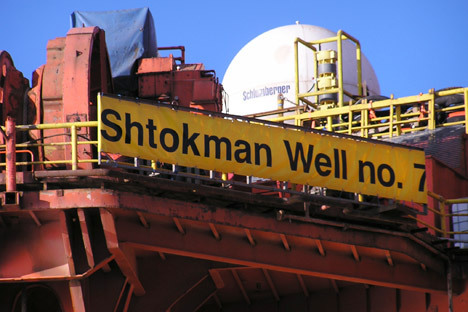 Shtokman is 550 km away from the shore, at a depth of about 330 metres. Vedomosti sources told the paper there were plans to develop the South Kirinskoe deposit earlier than Shtokman. It should become the base for a Gazprom LNG plant in Vladivostok that is due to begin operating in 2018. However, Grigory Birg, a co-director at Investcafe, remained sceptical, saying the new project will require huge investment and may face the same fate as the Shtokman project.